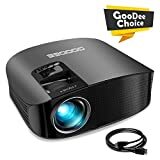 Vamvo Ultra Mini Portable Projector 1080p HD DLP LED is currently selling at $208.00, approximately $4.45 lower than average, giving a potential saving of $191.99 right now. With a lowest price of $198.00 and an average of $212.45 it is selling on the low end of its usual range. Price volatility is 1.19% (meaning it does not change often), so the price should stay low for a while. Right now this product is a recommended 'good deal'. 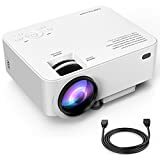 Compare the current price, savings (in dollars & percent) and Buy Ratings for the top Portable Projectors that are closely related to Vamvo Ultra Mini Portable Projector 1080p HD DLP LED. Here is how Vamvo Ultra Mini Portable Projector 1080p HD DLP LED compares with other leading Portable Projectors. Vamvo pico projector S1 --- mini size, multiple function, more fun. Features? Potable Design --- The size of Vamvo mini projector S1 is a bit bigger than the iPhone7 plus, so it's easy to carry to anywhere to enjoy movies, music or play games anytime. ? Flexible Connectivity --- The HDMI/USB/TF/3.5mm Headphone slots allow you to connect many common devices such as: Laptop, PC, DVD, TV, PS4 game machine, USB disk, iPhone/iPad, Android phone/tablet, Amplifier/Headphone etc.? Humanized Slide Switch Design --- The projector will be started when you turn the lens bezel up. ? Vision Protection --- S1 HD mobile projector brings clear image and reduce blue light stimulation, effectively relieve eyes fatigue.? Low Fan Noise --- The fan noise is lower than other LED projector which will not influence you during watching movies or football games.? Built-in Speaker --- The built-in speaker could transmit the powerful and crystal clear sound quality without the need of costly external speakers. Warm Tips:1. 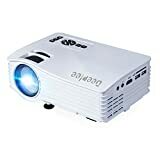 For better performance, please use this projector in dark environment like in a cinema.2. For copyright protection, the projector may not support to play the videos on Netflix via Multi-screen function. However, Netflix content can be snyced/displayed on the projector if it's connected via HDMI. Basic Specification:Resolution: 854*480(Support 1080P)Display System: 0.3"DLPLuminant: R,G,B -- LEDSpeaker: 1.5WPower Input: 12V 1.5APower Output: 5V 0.5ABattery: 5200mAPower Consumption: 20WWorking Temperature: sea level time 0-35?Projector Size: 15-100 inchesProjector Ratio: 1.4Projector Distance: 0.5M--3MWeight: 9.56oz Package includes:*1×Vamvo Pico Projector*1×Remote Controller (no batteries included)*1×AC Power Cable*1×User Manual FeaturesCOMPACT, PORTABLE, VERSATILE ---- This projector's compact and lightweight design, with a tiny frame of 5.7 * 3.2 * 0.9 inches and a weight of just 0.6 lbs., allows you to take it wherever you go. It's extremely portable and easy to set up. It is as if you have a Smart TV carried along in your pocket. 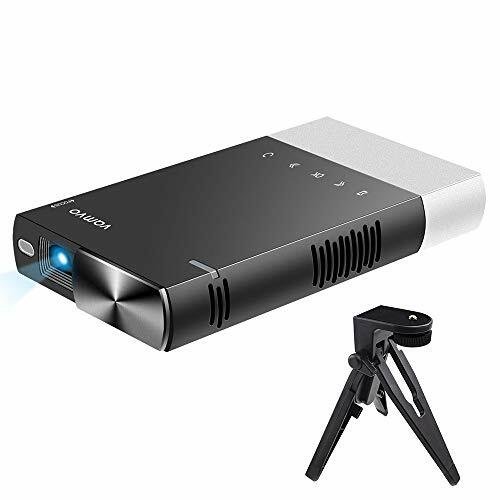 Ideal for use in small meetings/gatherings, classroom, or business environments.MULTI-SCREEN SHARING ---- Vamvo mini projector adopts the latest Multi-screen technology. It supports AirPlay, DLNA, and Miracast technologies. You are able to project the screens of your iPhone, iPad, and other smartphones onto a 130"large screen (maximum) with a lightning cable, USB cable, or Type-C cable. This projector allows you to instantly project your mobile screen content onto the wall for your colleagues, friends, and family to watch.VIBRANT DISPLAY ---- Make it your personal sports game projector. Enjoy our projector's vibrant color and crystal-clear image with a max resolution of 1080p. An ideal screen size of 80 inches can be achieved with a projection distance of 5 ft. 5200mAh long battery life allows it to play a movie for more than 2 hours without a chargeMULTIMEDIA VIDEO PROJECTOR* ---- This mini projector is compatible with: iPhones, iPads, Android devices, laptops, PCs, MacBook, XBOX, PS3/PS4, and more. Rich ports such as HDMI, USB, TF and Micro SD ports are available.